New Powassan NOJHL team owners Marc Rivet, Graeme Bruce, Ray Seguin, Jim Bruce and Dan Rivet, display their new logo and jersey for the upcoming season. They were joined by Battalion head coach Stan Butler (3nd from the left), Battalion Asst. New Powassan NOJHL team owners Marc Rivet, Graeme Bruce, Ray Seguin, Jim Bruce and Dan Rivet, display their new logo and jersey for the upcoming season. They were joined by Battalion head coach Stan Butler (3nd from the left), Battalion Asst. GM Matt Rabideau (2nd from right) and NOJHL commissioner Robert Mazzuca (far right). PHOTO BY LIAM BERTI. 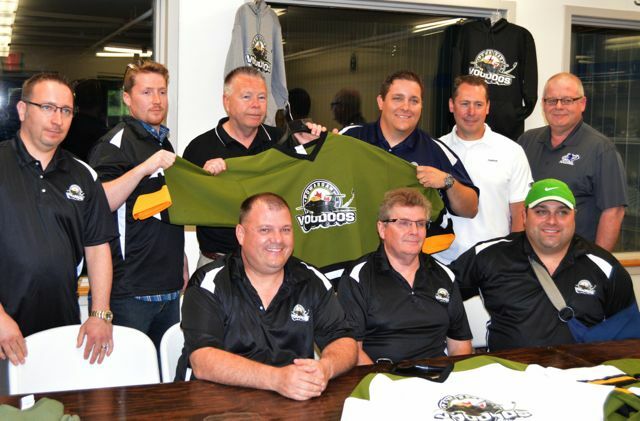 What started as a mere joke between friends has turned into a dream come true for the owners of the Northern Ontario Junior A Hockey League’s newest team, the Powassan Voodoos. The NOJHL is returning to the Northern Ontario town for the first time since 1994 and on Monday afternoon team owners and affiliates officially announced the inception of the team for the 2014/15 season. Just days after being voted into the league, the franchise released its new team logo and uniform at the Powassan Sportsplex, where the team will kick off its inaugural campaign in September. Team owners Bruce, son Graeme Bruce, Dan Rivet, Sylvain Rivet, Marc Rivet and Ray Seguint, as well as Powassan Mayor Peter McIsaac and league commissioner Robert Mazzuca. were all on hand to mark he occasion. While the team brass did acknowledge the late start at recruiting a team, they plan on announcing the dates of their first player development camp later this week. Meanwhile, the team plans on having season tickets available within two weeks, with hopes of selling upwards of 300 by the start of the season. The organization was quick to point out their newly-secured affiliation agreement with the North Bay Battalion, setting the stage for the Voodoos to be the primary feeder system for the OHL club. Battalion Director of Hockey Operations and head coach Stan Butler also attended the press conference to mark the commencement of the affiliation between the two clubs. “We’re excited about it; we think it was necessary,” said Butler. “We believe that if we’re going to be a Northern Ontario team in the Ontario Hockey League, then we want a Northern Ontario affiliate. The newly appointed Voodoo staff has been chosen based on the endorsement of Battalion personnel as well. Most notably, former Jr. Trappers general manager and president Chris Dawson has been named the team’s general manager and vice president of hockey operations. The team owners said the head coaching position will not be announced until Tuesday. “One of the agreements that we have amongst ourselves is we’re not hockey guys; we’re going to let the hockey people do the hockey things,” said co-owner Jim Bruce. As well as their affiliation with the OHL team, the Voodoos have chosen to keep in line with the olive, yellow, black and white Battalion livery and brand, while the Voodoo name was based on the supersonic fighter jet. Powassan, along with Elliot Lake, were unanimously voted into the league by the executive board last Wednesday. While the official league schedule has yet to be confirmed, Dawson said the majority of the Voodoos’ home games will be played on Friday and Saturday nights, with the occasional Monday night match as well. Just weeks ago, the health and sustainability of the NOJHL came into question after multiple teams relocated and another team withdrew entirely. But now, with just over two months before the 2014-15 season, the league boasts nine organizations for the first time in its history. Liam Berti is a University of Ottawa journalism graduate who has since worked for BayToday as the City Council and North Bay Battalion reporter.